Recipes for a summer dinner party can help you throw a meal together at the last minute or create a feast that will have your guests begging for more. Parties can definitely be a lot of work, but the fun that ensues is certainly worth it! Small parties can be quickly thrown together by hosting a cookout or potluck picnic. Larger parties require more planning time, however. Keep the following points in mind when planning your summer celebration. Location - If you are planning an outdoor activity, do you have an alternate location in case of inclement weather? Time - A dinner party usually indicates an evening meal, but how late do you want your meal to be? On hot summer nights, later is often better if you're eating outside. Menu - How extensive will your menu be? Do you have favorite, tried and true recipes, or do you love trying new ones? If so, check out websites and recipes that offer some wonderful food choices for a summer dinner party. Many of these are simple to make, although you may have to do some prep work the night before. We're here to help you get the party started, so check out the recipes and websites below. Prepare to grill on medium heat. Quarter peppers, discarding stems and seeds. Place peppers skin side up on hot grill. Cook peppers covered for four to five minutes, then turn over and repeat. Peppers are ready to serve. What really adds some "zing" to this potato salad is the Dijon mustard. In a large pot, cook potatoes in salted water, bringing to a boil then reducing heat to simmer and cook until tender. In a bowl, mix celery, onion, vinegar, mustard, salt and pepper. Drain cooked potatoes, and add to celery mixture. Toss well, and serve warm. The following recipe is based on cooking eight grilled steaks. You can adjust the amounts accordingly. Mix together marinade ingredients, place steaks in marinade, and refrigerate at least four hours but preferably overnight. 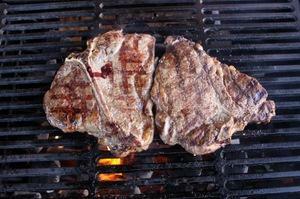 Grill steaks to personal preferences, adding marinade while cooking if desired. Serve with salsa on the side. LoveToKnow Cooking - From appetizers to holiday recipes and more, LoveToKnow can help you plan the best dinner party of the summer. What's Cooking America - Recipes at this site vary from a 7-course prime rib dinner to an outdoor smoked salmon dinner and more. Create a summer dinner party that will have your guests talking for months to come!